Fair Isle Bird Observatory: the Warden's diary: Wind, birds and beer. 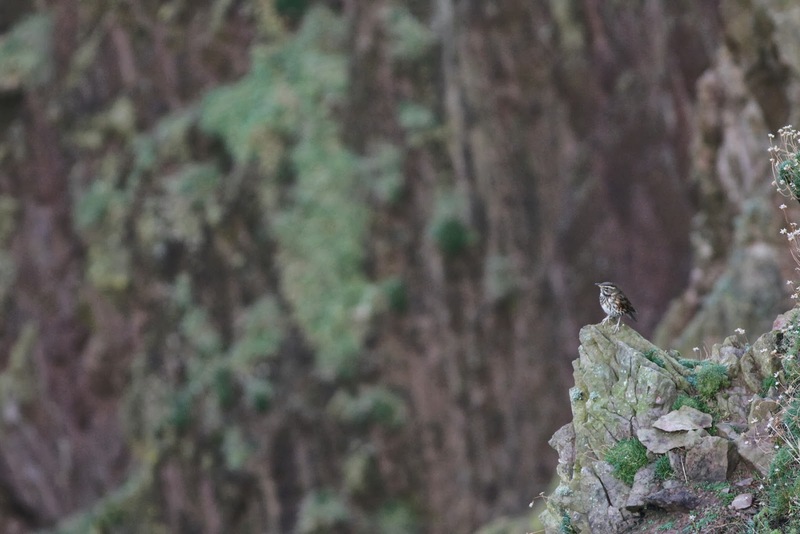 The south-easterly winds continued at a hefty speed and, although it remained largely sunny, the birds were mostly to be found on the sheltered north and west cliffs. The year list benefitted from two Richard’s Pipits and 2 Lesser Redpoll (both 1st), whilst other interesting arrivals included two Little Buntings (30th, with one on 1st), Bluethroat at Setter (30th), a Dotterel (30th-1st) and a Corncrake at Wester Lother (1st). You wait three years for one... 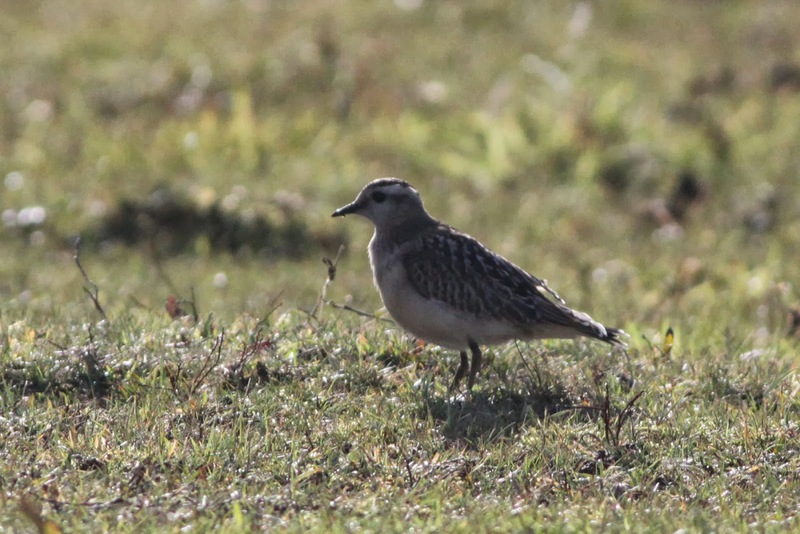 The Dotterel at Barkland is the second one I've seen this year after being my biggest Fair Isle bogey bird up until this spring. 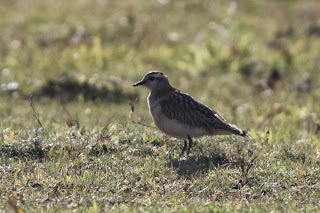 It has been lingering at Barkland in the Golden Plover flock. The Syke’s Warbler remained until 30th only and, whilst there were no new rarities found, the birding was still good as various species increased in numbers. Counts on 30th included 12 Yellow-browed Warbler (with 9 still on 1st), 24 Goldcrest, 6 Chiffchaff (increasing to 8 on 1st), 3 Lesser Whitethroat, 14 Whinchat and 3 Reed Buntings (with numbers rising to 16 on 1st). Thrushes started to appear in slightly larger numbers with the first 2 Ring Ouzel of the autumn on 30th (with 3 on 1st), the first Mistle Thrush of the autumn (1st) and peaks of 5 Blackbird (29th) and 54 Redwing (1st). The north cliffs have the shelter and therefore most of the birds, making for some interesting birding. Other counts of note included up to 3 Great Spotted Woodpecker, 2 or 3 Stonechat, up to 13 Crossbill (still a chance of another Two-barred surely? ), 65 Brambling (1st) and 6 each of Dunnock and Redstart (1st). A lingering Hen Harrier was joined by a second (1st), whilst there were also at least 3 Merlin and 4 Kestrel. An increase in waders saw 69 Golden Plover, the first Woodcock of the autumn and Ruff (all 1st), whilst a few more wildfowl included 3 Tufted Duck (29th) and a Barnacle Goose that spent part of the afternoon of 29th on Buness in a gull flock (with a flock of 15 on 28th the first of the autumn that I forgot to mention in the last blog post). Although most of the talk about the weather is related to whether it will bring further birds (I suspect the strengthening SE winds, that are likely to touch gale force in the next couple of days, will bring more things in yet) thoughts are starting to turn to the fact that the bar order hasn’t made it in yet. If we do get a mega before the Good Shepherd is able to sail again we may have to celebrate with gin and Tennent’s cocktails.